We’ve all seen choker necklaces from just about any fashionable icon — from that famous singer to the tv personality and to the sensational blogger. Chokers have been around for quite some time and were most revered in the 90s as everyone wore them and treated them like gold. But what people don’t know is that there’s more to this famous piece of jewelry than meets the eye. Chokers have quite a history which makes this necklace not as simple as one thinks. Art Deco in the 20s. Chokers had its time in the 1920s though they were not considered that stylish as they were a few years prior to the 20s. At the time, the bob haircut quickly became a trend and chokers complemented the cut as they were visible because of the length of the hair. Chokers were styled with the Gilded Age’s art deco style and were incorporated with pearls and diamonds and other precious gems be it real or fake. Victorian Era. While the elites during the Victorian Era could afford the luxury of having choker necklaces, there were plenty who couldn’t. What the poor did was to copy the look and used brooches and pendants made from pieces of velvet. During the Second Industrial Revolution, girls could easily purchase a 10 cent velvet or ribbon choker that has a faux pendant. As such, this piece of jewelry wasn’t just for the elites as the poor could already buy their own. 70s Rock Star Trend. The choker necklace made a comeback in the 70s and were a thing among men. Famous rock stars like David Bowie, Mick Jagger, and Jimi Hendrix paved the way for gender bending. 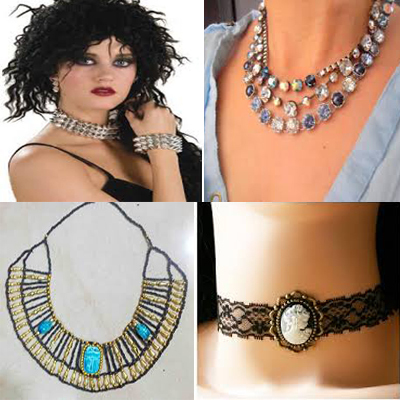 They experimented with chokers which heavily influenced the jewelry industry. Ancient Egypt. Ancient Egyptians were found wearing choker necklaces regularly. They see chokers as objects with special and protective powers. Apart from wearing the chokers on the neck, the royals wear them on the wrists and head. Also, the choker necklace, in the shape of gods, served as amulets. 90s Punk Staple. Chokers were revived during the 90s but instead of the diamonds and gemstone versions, the style took on a different route — grungy and emo. More and more women donned fabric and velvet chokers that contained metal clasps and trinkets. There were also metal chains, dog collars, and padlocks. It’s amazing how chokers have started and how they have evolved and styled in different eras. Clearly, it is one fashion staple that will stay. And it will always serve as a reminder of the best moments of fashion throughout the years. Gold republica is one of the best online shops for hip hop jewelry and rapper fashion accessories online in USA. I have kinda bought 23 items from them including hip hop chains , gangster bracelets, knuckle rings and other rock star jewelry for men and women.